Ross Island to Port Blair Island is approx. 2/3 km. Regular ferry is available from Port Blair. Travel time via ferry is 15 minutes. Visit Ross Island for sightseeing then by the same ferry go to North Bay Island. History of Ross Island is passed from generation to generation. Ross Island was named after the surveyor Sir Daniel Ross. Form a distance it seems to be an Island with thick forest and no human activity. The Government that does not allow any new constructions work to be undertaken. Ross Island was the headquarters of the Indian Penal Settlement during the British raj in India. Ross Island is located about 3 km east of downtown Port Blair. One can hop on private ferries or take a public boat ride from Phoenix Bay Jetty to Ross Island. Boat fare starts from INR 100 per person. One way ride takes about 15 minutes. Visitors can also take ferries from Rajiv Gandhi Water Sports Complex jetty. Package tours from Rajiv Gandhi jetty cover Ross Island and North Bay Island for INR 360 per head. One can also hire the local fishing boats to explore mangrove creeks or Mount Harriet National Park. Due to lack of the roads and vehicles, walking is the only option to get around on this small island. The Island had everything and even today we can see a bazaar, bakery, stores, water treatment plant, church, tennis court, printing press, secretariat, hospital, and cemetery. But, the Ross Island settlement was abandoned in 1796 as the mortality rate was very high. A number of water borne diseases has surfaced then. Six decades later, the 1857 Revolt forced the British to turn to Andaman again and this time, their stay lasted for 90 years. During the Second World War, the Andaman and Nicobar Islands were captured by the Japanese in 1942. The Japanese rule lasted till 1945. The Japanese army did not quite care about those who lived at Ross Island after the British army was left. The degree of pain and suffering only increased for the residents of Ross Island. The freedom fighters that were sent here during the uprising against the British built the structures that we can see today. Most of these are in a decrepit condition. The structure included the bungalow for the chief of the penal settlement. If you go get an opportunity to come to Ross Island the governor bungalow is located on the hill top. Even today we can see the Italian flooring that remains and visualize the entry, the living room etc. The old structure would have fallen a long time ago. But have stayed in place due to the Ficus roots that hold them. As we walk and explore Ross Island you shall come across spotted deer, rabbits. These deers have become so immune to people around them that there are known as Fearless Deers of Ross Island-Andaman. Due to water erosion one end of this Island has started to appear submerged in water. Some local say that the Island is sinking. 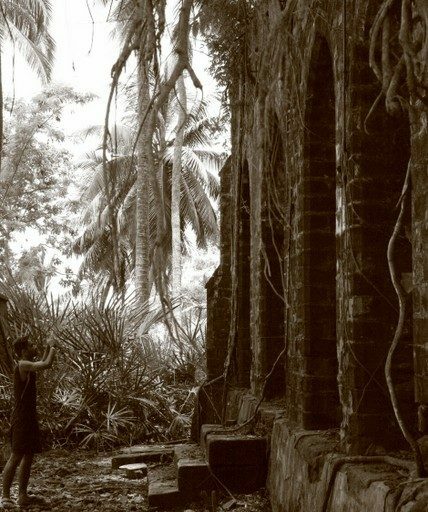 Other stories that we heard was that Ross Island is haunted too. Rest we shall leave is to you to explore. It’s been told Netaji Subhash Chandra Bose, who took the help of Japanese in his fight against the British, stayed at the Island for a day in December 1943. Netaji also hoisted the national tri-colour at the top of the Government bungalow. Even today we can see the bunkers built by Japanese on Ross Island. Ross Island is famous for its BUNKERS. The bunkers were built and used as watch points to safeguard the Island from any attacks from incoming ships. The Cellular Jail museum has a one picture of Netaji in Andaman Island. A massive earthquake struck Ross Island in 1941. It is said that the earthquake actually tore the Island. This earthquake was one of the reasons for the Japanese to abandon Ross Island.Treks and Trails recommends Best time to Visit Ross Island. Visit Ross Island should be done in the second half of the day. As once you have completed the tour of the Island which would be approx. 90 minutes. Behold get ready for Sound and Light show. There is small Amphitheatre. On visiting the Island, the first time is seemed very strange the set up about the Amphitheatre. However best was yet to come from Ross Island. The bakery at Ross Island turns into a giant screen and History is relieved. It feels nostalgic as the history unfolds right in front of us. This sound and light show at Ross Island Andaman gives you a glimpse of the glorious past and the great sacrifice done by our freedom fighters. The voice of Gulzar sahib and others keep you entertained throughout the 45 min presentation.